Based on a best-selling novel Hinterland (which in turn was based on the stories collected of real migrants by Caroline Brothers), Flight balances optimism and tragedy, following two young men as they walk from Kabul to London. Created by Vox Motus (the company behind 2014 festival hit Dragon), Oliver Emanuel's script draws on his skills as a writer of radio plays, and lays out the boys' travels and interior journeys through a clear narration, with moments of trauma left unexploited by sensationalism and extended metaphors of flight used with a subtle power. But it is Jamie Harrison's scenography that lifts Flight: each audience member watches a rotating diorama from an individual booth. The inspiration of the comic book is brilliantly realised, as the use of panels to isolate individual emotions imitates the form exactly and offers a place for meditation on the adventures and their wider implications. 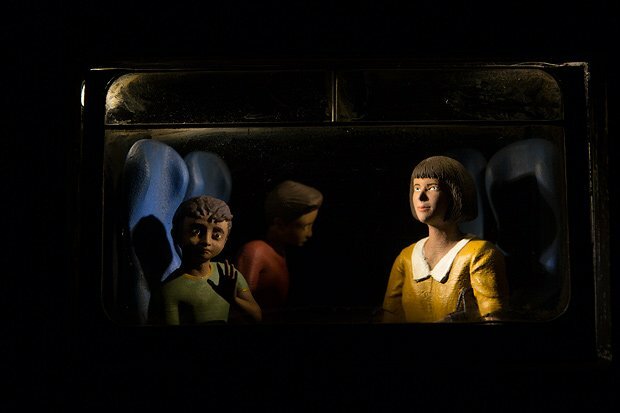 This intimate experience turns Flight into an event rather than merely another worthy commentary on social challenges: the detail of the diorama enhances the magic realism of the script: when border guards become vicious sea-gulls, or the boys are cooped up in a cell-like bedroom, the tiny statues capture the diverse atmospheres without breaking the measured pace. Flight is not a 'true story', and, as such, is capable of dealing with the wider issues of migration without relying on the authenticity of the two boys' lives: their shared journey offers both a triumphant and tragic conclusion, and the gentleness of the script and scenography reveals a rich reflective relevance. Church Hill Theatre, until 27 Aug (not 16, 22), times vary, £15.